Old Car Nut on Board - $10.00 : Bob Hoyts Classic Inspection Stickers, Add a Final Touch to your Restoration! 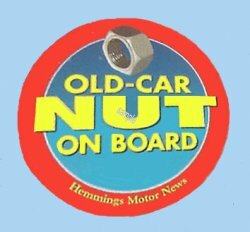 This sticker is a for a cool "Old Car Nut on board. It is approximately three 2 1/2 inches square and has our patented "Peel and Stick" format that allows it to be attached to the inside window of your classic car.